Ryan Paul is currently a senior at Chaska High School and is the founder of the Chaska Hawks Broadcast Network. Ryan's spends his summers at Hazeltine National Golf Club where he is a member of the Turfgrass Staff (Grounds Crew). Ryan is also a tournament director for the local boys and girls basketball tournaments, as well as the local youth baseball tournament. A former youth football coach to his younger brother, Ryan is very active in the community. Ryan also officiates youth basketball and is the director of grounds crew for the NAFA National Softball Tournament in Chaska. Click the image below to read Ryan's message. Ryan Paul started the "Chaska Freshman Basketball Report" in 2015 when he was a freshman at Chaska High School. The CFBR was a small website that included journals and articles recapping the freshman team's games. While doing the CFBR, Ryan started doing P.A. Announcing in the freshman gym. Later that season, Ryan took a leap and did a live-audio broadcast of the Varsity section quarterfinal game vs Prior Lake. The next season (16-17), Ryan (then sophomore) moved up to covering the Sophomore, JV, and Varsity teams on his new website: The Chaska Basketball Report. Ryan continued to write articles and do PA for the Sophomore and JV games, but would then do a live audio broadcast of the varsity game at the end of the night. After encountering troubles with the audio service, Ryan started using The Cube to do a live video and audio broadcast of the varsity games. The live broadcasts exploded in the community, and Ryan quickly was reaching over 500 viewers per broadcast. Ryan broadcast every remaining boys basketball game that season. A major addition during the 16-17 season was broadcasting Boys Hockey. Ryan would stream the hockey games on nights when there was not a schedule overlap with basketball. Shortly after the start of hockey broadcasts, Taylor Hansen and Colin Jacobsen joined the team and broadcast hockey games when Ryan was at a conflicting basketball game. By the end of the 2016-17 winter season, the crew had broadcast roughly 30 games and reached an average 500 viewers per broadcast. In the summer of 2017, Ryan (now junior) officially changed the name of the service to "Chaska Hawks Broadcast Network" and it was clear that the direction of the website would lead to further expansion. Ryan found a team of classmates (on top of Hansen and Jacobsen) that were willing to work for him in production and other areas in order to broadcast the amount of games that they were now committed to work. Recent equipment investments and upgrades meant that more people were needed to produce a higher quality broadcast. CHBN released that they would be broadcasting every boys basketball game and boys hockey game in the winter 2017-18 season. They did just that (except 2 due to broadcast rights). The team broadcast 52 games in the span of 3 and 1/2 months. By the spring of 2018, the number of average viewers skyrocketed to almost 1k per game. The winter season proved to be big when the final number of viewers totaled a massive 50,200. CHBN also expanded into photography and media production through the introduction of CHBN Images and CHBN Productions. Ryan's crew is now looking to expand further and plans on broadcasting more baseball games (did two in 2017), introducing the game of Ultimate Frisbee, as well as major plans to enter into football games into the fall. Before he started the CBR, Ryan would sit in the stands and just watch the games. Before a game vs Jefferson, Ryan developed the first version of the stats sheet. While watching the team warm up, he pulled out the laptop and threw together what would eventually start the CBFR/CBR. The "stats sheet" has now evolved into two spreadsheets, that track each player's shots, and makes thousands of calculations, and formulations. As the season progressed, and Ryan became more involved with the teams, he started to play music and PA announce the games. The equipment he used was a 1995 boom-box, and his wireless football referee microphone, which he modified for use with a handheld microphone. Eventually, he was able to use a newer speaker and microphone. Soon after becoming the PA announcer, Ryan created a website dedicated to the 9A and 9B teams. It featured rosters, schedules, stats and recap articles. The recap articles caught attention, and propelled the CFBR website into the public eye. You can still view the Freshman Basketball Report website, by clicking here. After the freshman season ended, Ryan wasn't ready to be done. On the day that Chaska played Prior Lake in the section 2AAAA playoffs, Ryan arrived at school at 7:30am to prepare for the long night that would be ahead. The dismissal bell at 3:00pm rang and he began preparing for the game. While lowering and raising hoops, setting up the bleachers and scorer's tables (video), he was thinking about where to broadcast from. Time was not necessarily tight, because the main gym was ready for action at 4:00pm, and the girls team took the court for practice. At 5:30pm, the girls were gone and Kenny had began scrubbing the floor. With 90 minutes until gametime, he set the scoreboard clock and PA mic up, and took position. The game was not one to disappoint, even though the Hawks were victims to a devastating overtime loss. Listen to the game here: 1st half, 2nd half. 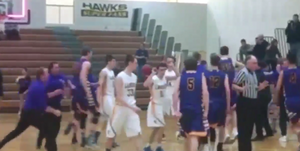 LEFT: Chaska senior Jameson Meyer hits a three at the buzzer to send the game into overtime. You can listen to the audio, paired with video of the shot by clicking here. The Chaska Freshman Basketball Report website was officially locked in March of 2016, and the new site: Chaska Basketball Report, was created. The new website will focus on 10th Grade, JV and Varsity basketball. We will cover offseason news when able, and will begin full coverage of the team in fall of 2016. For more information about our story, or to join the team, please email us at ryan@chaskabasketballreport.com. 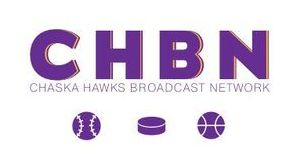 In the winter of 2016 Ryan founded the Chaska Hawks Broadcast Network. The internet-streaming network was a big hit for parents, grandparents, and all fans. All boys varsity basketball games were streamed live and on demand to The Cube. Ryan called play-by-play, operated the camera, and produced the graphics all on his own. To visit the CHBN website, click on the Broadcast Network tab above. The Chaska Hawks Broadcast Network underwent a major enhancement in this time period. Equipment upgrades, expansion into baseball and boys hockey, and the addition of a tremendous staff composed of graphic editors, producers, personalities, and more. The broadcast network - which Ryan still does PxP for all boys basketball games - now streams almost 50 games in one MSHSL season. You can watch all of these streams by going to the Broadcast Network tab.